Two upcoming weekend offers – if you’re quick! Rooms update What do you think of our new photos of the rooms? Some said the pics on the website never did the place justice, so we invested in a fish eye lens to help get a better view – does it work? Or make you feel a bit sea sick!? See the new pics here, with info about how to book a retreat with us. NB – two weekend dates coming up – see below. And come join us for a week’s stay July 16-20th with a special offer – help with your book from submissions expert, editor Katherine D’Souza, including an analysis of your novel and a class on what agents look for in a submission. Plus – expert of the month – should your protagonist be downtrodden at the start? In order to rise to triumph by the end? The journey would be harder, and the conflict would be greater for sure, it is an essential element so that their journey is never easy. So says Robert McKee, expert of the month and Hollywood script editor, read more below. Author Congratulations : RFY regulars AJ Pearce and Julie Cohen! First though, two congratulations this month. 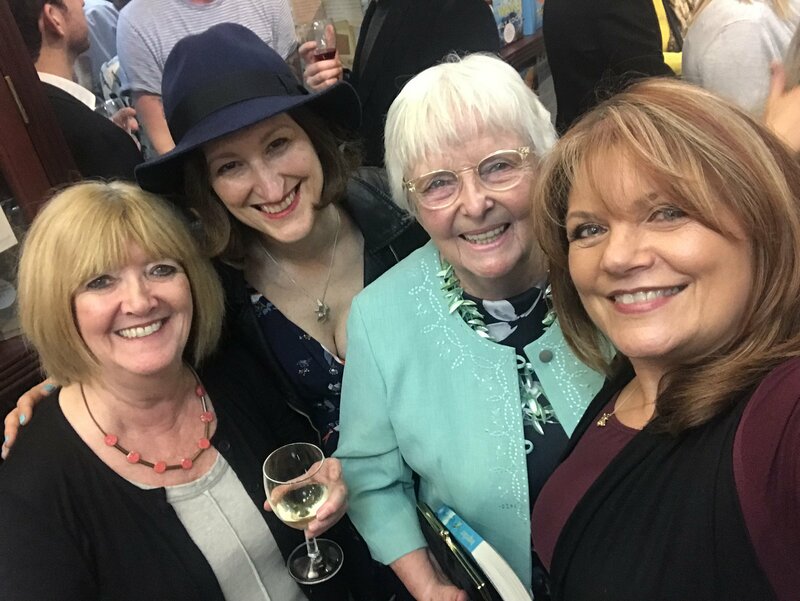 Inspirational mentor Julie Cohen has made the new Richard and Judy list with her brilliant novel ‘Together’ – did you see the twist coming? Julie’s October workshop here in Sheepwash is about to be confirmed, and you book direct with Julie, but let me know if you want to go on the list. Last year’s sold out early, so be ready! 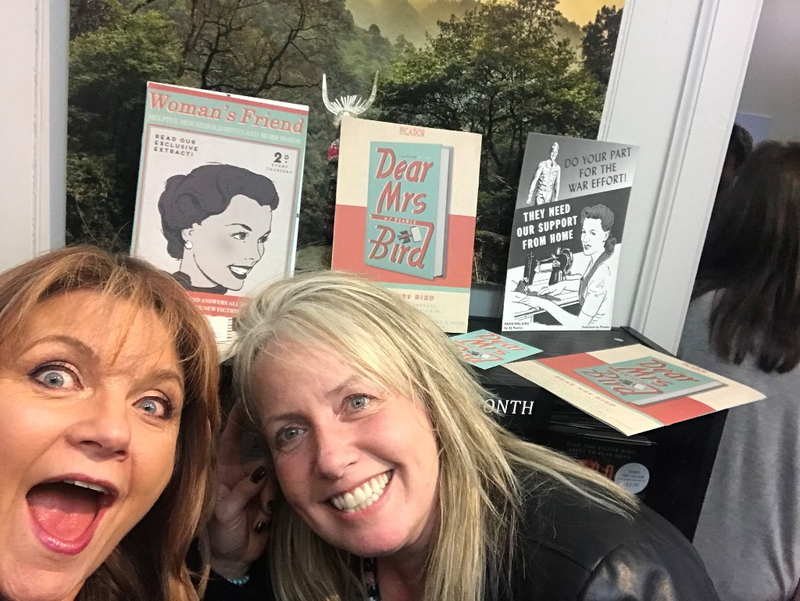 Second, AJ Pearce, talented debut novelist and already one of the Guardian’s New Faces of Fiction 2018, launched the long-awaited wartime comedy-drama, Dear Mrs Bird on Thursday 5th in a packed Goldsboro books off Charing Cross Road and it’s already tearing up the book charts. Talking of inspirational! AJ’s story is charming and compelling and nostalgic and will be huge, we just know it. It’s already got a TV company planning their production schedule, several of whom attended her launch. Plus AJ’s already been on book programme, Front Row on Radio 4! So we will see lots more of her Keep Calm and Carry on We’re British, type, characters. I loved the book, and have now bought the audiobook. AJ’s signed novel sits pride of place in our Guests’ Bookshelves, since it was partly written here at RFY. Congrats to AJ and do get it if you love a good tale about loyalty, love and friendships. More here on my Book of the Week blog and a good time was had by all. 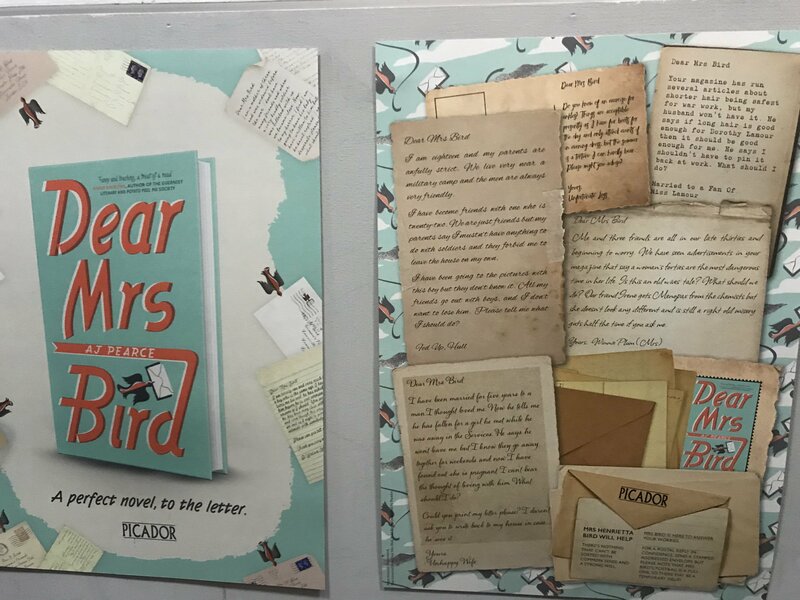 Dear Mrs Bird more here on Amazon. Last month in the March newsletter we mentioned the specialist ex-cop whose website is really useful for police procedural queries. Well this month it’s the Hollywood script-doctor himself, Robert McKee. He may be focussed on script writing, but his info translates well to plotting for novels too. From Pixar to the BBC, TV, film and theatre, McKee has devoted his later career to helping writers write better, including some massive names. And he’s famed for his international scriptwriting workshops. If you need to study plot, dialogue, narrative drive, and subtext, whatever platform you’re writing in, McKee’s best-selling book ‘Story: Substance, Structure, Style and the Principles of Screenwriting is a gold mine of relevant information which will save you much heartache especially if you’re a beginner. McKee is renowned in the industry and if you ever saw Adaptation, the Nicholas Cage film, it was McKee they characterised as the crotchety but brilliant script expert. His many and varied workshops around the world will ram the important points home including regular ones in London. I’ve been on his ‘Story’ weekend in London – long days, very intensive and eye-opening. I also attended a couple of his one day, focussed workshops including ‘Love Story’ and TV Writing. Just make sure you turn your phone right off or you may publicly rue the consequences of it ringing! And sign up for his newsletter, where he will give you not only regular snippets of info about writing conundrums but also short videos analysing films, and links to other free tips and hints. Robert’s website is McKeestory.com where you can sign up for his regular updates. The latest newsletter discusses how the protagonist should start off as the underdog in order to make for a more satisfying story. Many of you will do this already, of course, but any beginners, check out his advice. Beginners Advice for Self-Publishing Plus there’s a lot of info in the Writers’ Workshop website (Jericho writers now) regarding where to begin if you want to self-publish. Plus – Read it Write it Sell it (where I do a regular book review) for the original post Beginners Guide to Self-Publishing. Screenwriting Workshop Plus we have a super four day workshop on writing for TV and film this summer at Retreats for You – June 11th Monday till Friday – with Retreat West. More here. Last minute availability on our Photography Weekend, 20-22nd April – but great news if you just want to come and write as we have spaces for two – and are open the whole weekend, full board. Ditto the following weekend retreat – 27-29th April – three places already booked, though – for authors to come and ‘just write’ so if you would love to come Friday afternoon through to Sunday lunch, or Monday, email me now for this rare weekend offer. Plus many more retreats during the Summer, including yoga (stretching) for writers, more here. Contact us soon on info@retreatsforyou.co.uk. We are now booking through the Summer. 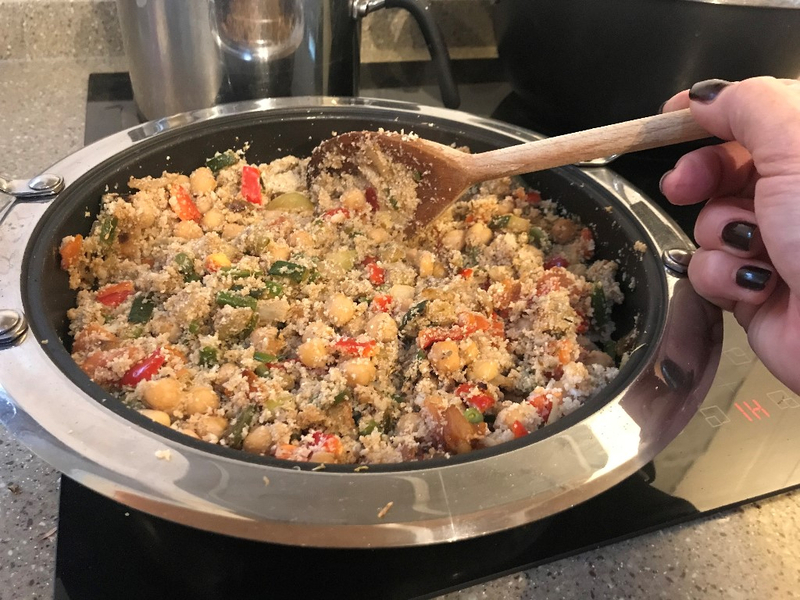 It’s one of my lovely co-host’s finer moments, and began as plain raw cauliflower whizzed in a food processor to couscous size. But now it’s developed into something far more exotic! First, Wendy stir fries the onion and courgette, then adds the tomatoes and simmers to create liquid, then in goes the cauliflower. Other ingredients follow – to taste – including red pepper, chick peas, cinnamon, coriander, cumin and thyme, plus season to taste. It went down very well, served with wilted tahini Kale and fresh sardines. 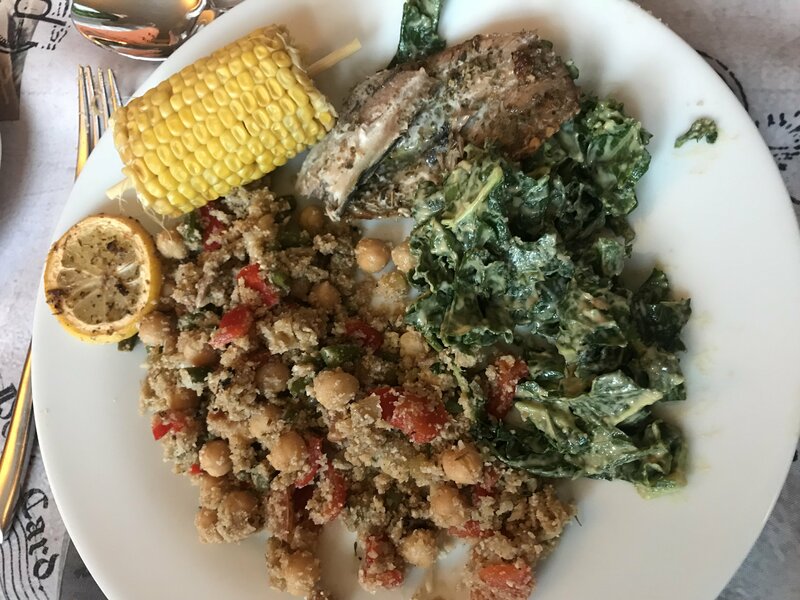 Why not experience some of Wendy’s fabulous home made cooking and book a stay, our retreats are full board including wine at dinner and all hot drinks and snacks like banana bread, flapjacks, bread pudding and home made yogurt and bread. Just £95 per person per night. Ps please follow us on Twitter and Facebook. NB you are on this mailing list as you subscribed to Retreats for You – pls use unsubscribe button if this is not what you want. But if you love it, please forward to a writer friend! Thank you.